As soon as I read the description for the new Ibuki Multi Solution Gel from Shiseido, I thought it just might be the solution for sensitive or combination skin that’s prone to both breakouts and dry patches. And Shiseido, founded in Japan in 1872, has 140 years-plus logged in beauty innovation, so they know a thing or two. Ibuki is a unique gel that targets breakouts, roughness, and the look of visible pores for clearer, smoother, and more radiant skin. I studied Japanese for a few years, so I was excited to find out that IBUKI translates to “inner strength”. The IBUKI collection is designed to address the unique skincare concerns of us multitasking millennials, regulating & correcting skin imperfections for stronger, healthier skin. Even though our lifestyles are unpredictable, our skin doesn’t have to be. 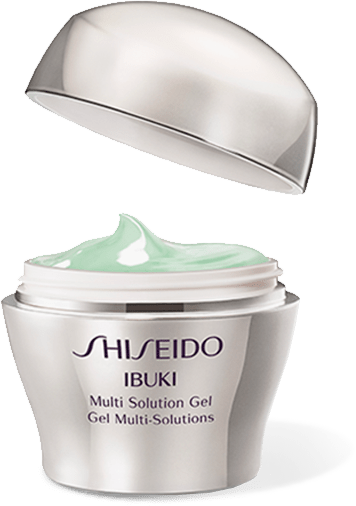 Shiseido Ibuki Multi Solution Gel rapidly repairs breakouts, roughness, and dry patches while minimizing the appearance of pores. This multitasking formula leaves skin feeling supple and smooth, while the dewy concentrated gel texture moisturizes and adheres well to trouble areas. Rebalance your skin and give it a smoother, more beautiful appearance. Plus, it’s free of phthalates! This all sounding good to you? Pick one up for yourself for $38 – or, enter our giveaway below and get one fo’ FREE! PLUS, the one you get in our giveaway comes with an exclusive fancy-shmancy Shiseido red makeup bag. Tres tres chic – or as they might say in Japan, kawaii desu ne?! US winners ONLY – sorry folks, I’m shippin’ here! General “ageing” issues as I’m about to turn 39. I also have pigmentation issues and dry skin during seasonal changes. I have mouth wrinkles,not fine lines. I’m always looking for something that might soften them. I am at the age where I am starting to get wrinkles. wrinkles are my skin concern!